Abdirahman Abees recited poems critical of the government at a hotel in Somaliland's capital, Hargeisa. Amnesty says authorities should focus on investigating the mistreatments Mr Abees describes in his poems instead of "harassing" critics. 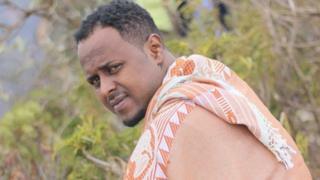 Mr Abees' lawyer told the BBC that the poem called on the Somaliland government to reform its prisons and criminal justice systems and was not defamatory. "He did not insult anybody," Guled Ahmed Jamac said. The themes that his client was raising "are important issues which concern us all", he added. Mr Abees' poetry often discusses issues such as police brutality, arbitrary detention and the treatment of prisoners. A number of other artists and journalists have been arrested in Somaliland for the same offence in recent years.